The Democratic candidate has no time for subtleties as she races to become the first openly transgender person elected to office in a Republican US state. Manassas, United States: "Look at the inside of my shoe, ok?" 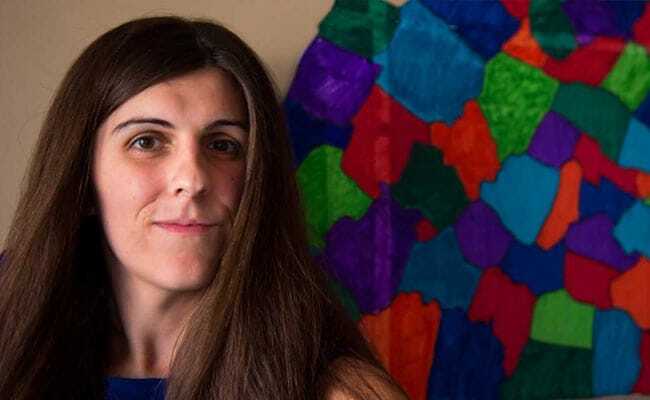 replies Danica Roem when asked how many voters she has already approached in her bid to win a Virginia statehouse seat. The Democratic candidate has no time for subtleties as she races to become the first openly transgender person elected to office in this Republican US state. Whether spitting in the trashcan during a recent interview with Cosmopolitan magazine or whipping off her ballerina flat to show its worn insole to AFP, this young woman does not shy from flaunting her working-class roots. "I am from Manassas," she says with a justified laugh -- the small town in northern Virginia's Prince William County exudes no particular charm. Danica was born there 33 years ago, under the given name of Dan. "I am running to represent my life-long home area," she says, pulling her long chestnut mane off the shoulders of her sleek blue dress. "I was born here, I grew here, I've worked here." The former journalist has emphasized she is not entering politics to be a LGBTQ symbol, under a president who recently banned transgender people from serving in the military. On the contrary, she aims to take on municipal issues using the knowledge she amassed during nearly a decade covering local news for the Gainesville Times paper. During that time she repeatedly interviewed long-time Republican incumbent Bob Marshall -- who became her opponent after she won the 13th district's Democratic nomination. The victorious candidate in the November 7th election will for two years serve in Virginia's House of Delegates in Richmond. Marshall has held the seat for 26 years, with constituents re-electing him 13 times. The Republican septuagenarian -- a staunch gay marriage opponent -- refuses to use the pronoun "she" when referring to Roem. He also refuses to debate her. The conservative has defended the state's efforts to pass a "bathroom bill" seeking to regulate which restrooms transgender people can use in government buildings. 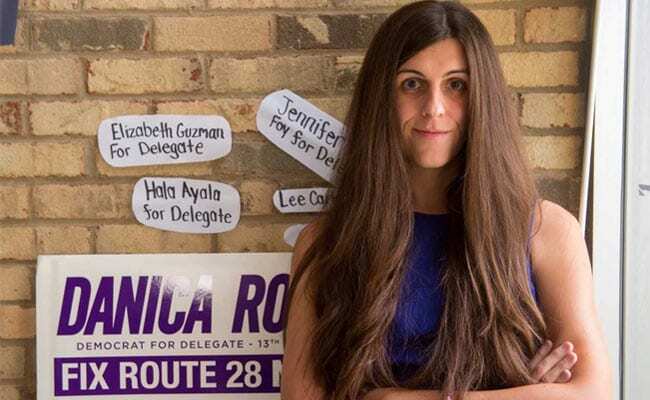 "Delegate Marshall's legislative priorities have been more focused on where I go to the restroom as a transgender woman than how his constituents get to work," Roem said of her opponent. "That's a giant problem for the people who live here." Roem prides herself on identifying the number one problem of her potential constituents: Route 28, the area's main highway. More than two-thirds of local residents must take it to leave the county everyday: "That means you have perpetual backups for traffic." A hot yoga enthusiast and metalhead who also happens to be transgender, Roem's campaign slogan is simple: "Fix Route 28 now." "If we were able to remove more traffic lights, then we would have more flow and go." Having toured Europe by visiting heavy metal festivals, Roem was impressed by the Old World's urban planning, and hopes to promote similar transportation networks back home. In her campaign headquarters a photo of Roem shows her playing a Dean Warbird ML-X guitar that features a V-shaped head, and she explains she plays a "combination of thrash metal and melodic death metal". "I am a vocalist," she says. "I don't like to say singer -- singer is for people who sing well." "I have a microphone and I yell into it"
Despite her insistence that she is "not running to be a symbolic candidate," her voice has carried well outside Virginia state lines, and her campaign has garnered national attention. More than 6,500 people have made spontaneous donations in support of her political efforts. The president of the Gay and Lesbian Victory Fund, an organization dedicated to improving the visibility of LGBTQ people in politics, donated $115,000 to her. The money -- always a crucial factor in US political campaigns -- allowed her to hire a team of 11 people who survey the district, make phone calls and distribute flyers. A few people have told members of her team or campaign volunteers that they will not vote for Roem because of her gender identity. But she says "not a single person at the doors has told me personally that they will not vote for me because I am transgender -- not one." Her shoes are worn and her opponent seasoned, but Roem is confident her tenacity will pay off. "He certainly has his base," she says of Marshall. "And at the same time he has never run against a candidate like me before." "I am uniquely qualified to defeat him." France's Historic Notre-Dame Saved, But Suffers "Colossal Damage"